Want to remember this for later? Go ahead and PIN it now! Grab a tissue, you may need it. It’s been nine months since we brought you home. I remember the first day we met, you came walking in the room at the shelter, found me, and laid your head on my lap. You melted my heart. You see, we weren’t planning on getting two greyhounds. We had already met your brother and knew we wanted to adopt him into our family. We made the trip to the greyhound shelter that day to play with your brother one more time. We wanted to be sure he was the right one before we made our final decision. But who was I kidding, Nash chose us. He knew we were supposed to be his parents. 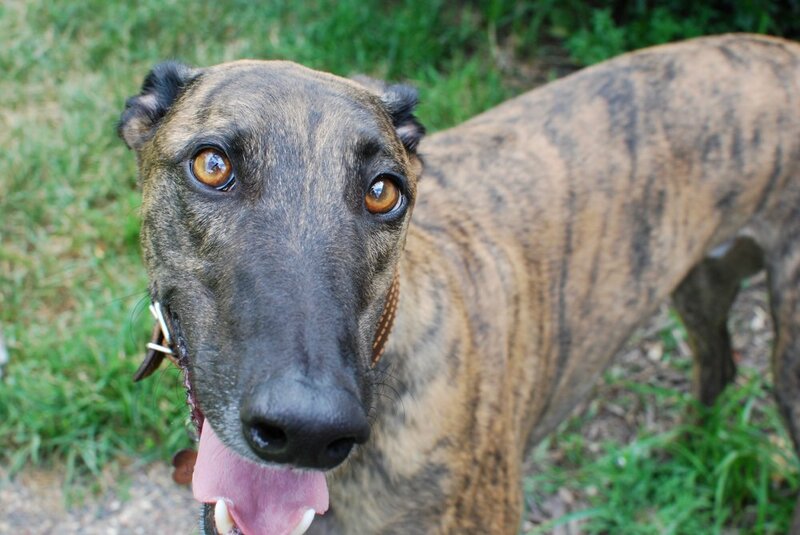 For some reason, on that day at the shelter, God asked us to ‘look at more greyhounds’. The sweet lady at the shelter brought a few girls and a few boys into the room to play. All of those greys are deserving of a home, but none of them picked us. Then, she mentioned your name. My eyes lit up when I heard her say ‘Roman’. You chose me. You chose us. We brought you and Nash home and you both were so nervous. We were sure this was the first time you had been in an environment such as our home. You literally walked into every room of the house 20 times. You did not sit down for the first two days. You cried the first night, all night. We were starting to wonder what we got ourselves into. But all that didn’t matter to me. I knew the newness would begin to fade and you would quickly settle in to your new home. But sweet boy, I couldn’t help but think about who raised you for the first two years of your life. Where did you sleep at night? Who were you with during the day? What did you eat? Who did you interact with? Sometimes I try not to think about that. I just imagine you have been with us all your life. Not that your life before us was less than good, because I am positive you were well cared for, wherever you may have been. Although I wasn't a part of your life these past two years, I want you to know how strong you are for competing in those races. I've watched some of your videos (only the good ones, of course). Roman, you have brought so much joy into our home. You have taught me how to be more patient. (Yes, there’s a little bit of dirt on the floor and no I don’t mind it at all.) You have loved us unconditionally. You are there to greet us at the door every day. (I mean, there’s no better welcome home than that.) You have helped us become better people and opened our hearts to things we never thought we would do. And although we thought we already knew how to ‘care’ for someone or something, you’ve allowed us to grow tremendously and become better individuals all around. And for that, Roman, I am forever grateful. So, as we celebrate your birthday, you won’t understand why we are hugging you or making it a huge deal that you’re getting a special treat - but we will. I definitely will. We’re remembering all of the fun we’ve had in these short nine months you have been ‘ours’ and thanking God for bringing you to us just when we needed you. Don't forget to hop on back over here in a few days for his birthday post. It's a good one! Catch ya later! Newer PostPersonalized Dog Tag & Roman's Birthday Festivities! Older PostThe Decision to Have ALL White Trim.